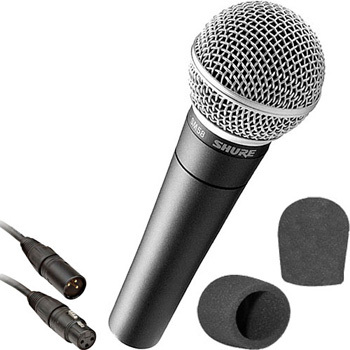 The Shure SM58 Cardioid Microphone Kit includes a microphone, an XLR microphone cable and a matching windscreen. This is a fantastic microphone for recording live vocals and is designed to record vocals and speech. It has a built-in filter to reduce breathing noise and its cardioid design helps isolate the main sound source while minimizing unwanted ambient noise.